Oscar Dunleavy is an unusual and wonderful young man. At fourteen, his gentleness and good humor have made him many friends in his small, Irish coastal village. His best friend - since they were little kids, really - is his next-door-neighbor Meg. But something went terribly wrong for Oscar. Oscar’s bike was found in the bay near the end of pier. There was no sign of him, but the tides do what they will, so it’s not surprising he wasn’t found. Flying back from an extended stay in New Zealand with her family for the memorial service, Meg is utterly broken—even more so because she was really angry at Oscar and ignored his many recent attempts to get in touch with her. Somehow, though, Meg and Oscar’s little brother Stevie don’t truly believe he’s dead. Oscar had too much hope for that. He had so much he would give it to other people, often in the form of delicious apple tarts he crafted himself. When the principal calls “Oscar’s best friend” to do a reading at the memorial service, Meg is surprised and tries to get herself together for it. There is no need for that. Everyone knows Oscar’s best friend is now a gorgeous new girl named Paloma. With her family having rented Meg’s house while they were away, it was Paloma whom Oscar turned to when he was feeling low, and it’s Paloma who knows what really happened to change Oscar from a carefree boy to someone who might decide to leave it all behind. 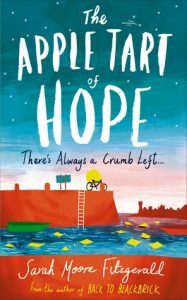 Sarah Moore Fitzgerald’s The Apple Tart of Hope is a story of friendship, jealousy, and, yes, hope that will leave readers with a sweet memory. Although less overtly magical than the Harry Potter series, there are some of the same ingredients in this short book. If you’d like another visit to Ireland, Eoin Colfer’s Benny and Babe will take you there, as townie Benny and tough girl local Babe manage to cobble together a partnership and a friendship.